The F1 is a 10 watt per channel stereo amplifier operating in balanced single-ended Class A without feedback. Each channel has only one gain stage and draws a constant 100 watts. It is a power trans-conductance amplifier (or power current source, if you like), replicating an input voltage into an output current. A regular amplifier sends output voltage to the loudspeaker. This is not that kind of amplifier. This amplifier ignores the elements in series with the load circuit, including back-emf, wire resistance, inductance and such, and creates voice coil acceleration in direct proportion to the input signal. It is well suited to sensitive full-range drivers such as Lowther or Fostex, and allows easy use of parallel loading networks to tailor the driver response. It has both balanced and single-ended inputs. The input impedance is nominally 80 Kohm, and the output impedance is 80 ohms. The output noise is around 100 picowatts (100 trillionths of a watt). 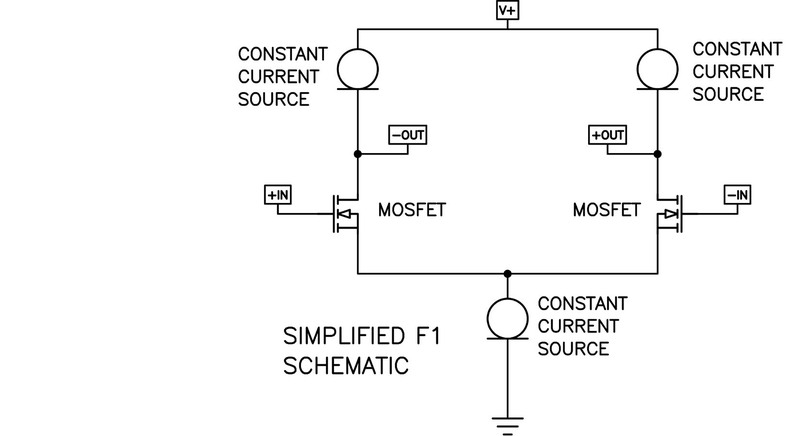 At this time, F1's are only available used, but there are a very few copies of new F1's which are updated using the new power Jfets as found in the J2 amplifier. See the F1J product page.